Guru, aka Tyville Guru, is a stunning 4-year-old brindle male born March 23, 2004. 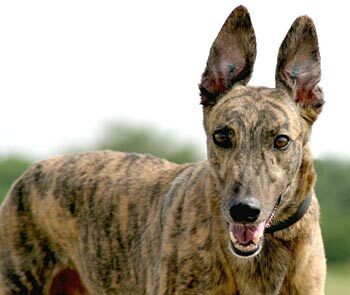 His sire is the late famous Gable Dodge, making his grand sire Wigwam Wag, and his dam is Glengar Breeze. 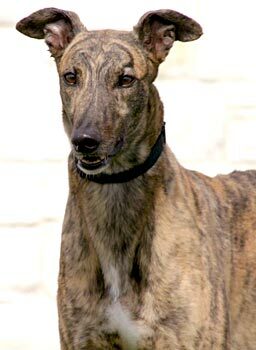 Guru was quite the racer, racking up 108 races all at the Corpus Christi track in Texas, starting February 11, 2006, and ending December 1, 2007. Guru was retired after the closing of the Corpus Christi track on December 31, 2007. Guru is ready to find his forever home, family, and his retirement couch! Guru's "good boy" cat test: Guru did not show much interest in the cats from the beginning. He sniffed Molly and she did her swat and hiss thing and that was enough to convince him he was right in not being interested in her. I then got out mild mannered Pepper and it took some convincing for us to get him to go by her. Finally he got some sniffs of her but, was not really interested. I would say Guru is cat trainable (almost cat tolerant). Please use caution and a muzzle when introducing him to cats. His introduction to small dogs will be later. 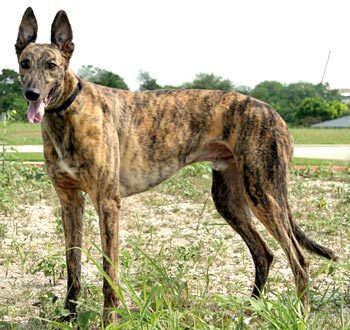 Guru is a beautiful, soft brindle grey that LOVES to play. He likes balls - soccer balls, basketballs and tennis balls and can hardly contain his excitement at the park when there are kids playing with balls. He thinks that he is the next David Beckham. He also loves to de-squeak squeaky toys and carries stuffy toys around like babies. He is happy to spend his days curled up on a soft blanket or doggie bed but checks periodically to make sure his humans are in sight. When we are not home, he seems content to be in his crate, though he offers an enthusiastic welcome when we return. He also enjoys hugs and having his soft neck scratched. Guru may be trainable with a confident cat, but he seems to think a running cat is like a rolling ball--a fun toy. Caution is recommended around cats or small animals. Bearing in mind that he has only been in a home for a few weeks, he is settling in very well. He generally does well with children. His foster home has 5 and 7 year old children, and Guru is not particularly bothered by loud sounds or quick movements. Guru is still learning boundaries. He thinks most stuffy toys are his (even if they belong to the children) and may try to grab one (or a ball) from a small child. He does not appear to be aggressive. He just wants to play. With more time, we are sure that behavior will improve. Guru has strong feelings about his bed area and does not like to be disturbed unexpectedly. Therefore, Guru may do best in a home without small children.